The first daily public Last Post ceremony was held at Pukeahu National War Memorial Park on Anzac Day 2015 and was conducted every evening until 11 November 2018 in front of the Tomb of the Unknown Warrior. Prior to the 5pm ceremony on Sundays, we remembered a fallen World War One soldier by reciting their story. These personal stories are now captured on the NZ History website. 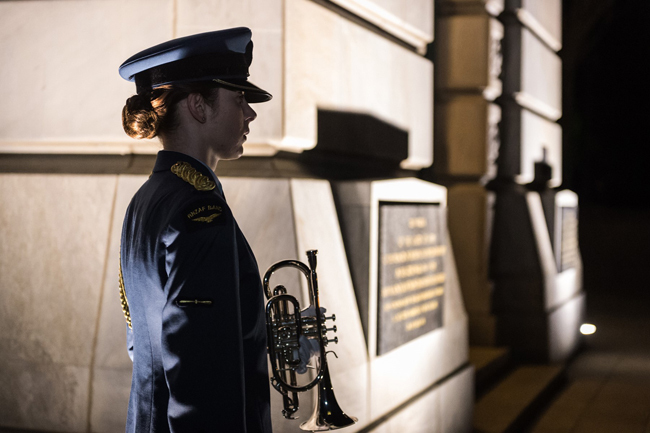 The New Zealand Defence Force, in partnership with the Ministry for Culture and Heritage, marked the First World War centenary each evening with a Last Post ceremony at Pukeahu National War Memorial Park. Every day at 5pm, a Last Post ceremony was conducted on the forecourt of the National War Memorial in Wellington. The service incorporates the lowering of the two New Zealand flags at the Memorial, the playing of the Last Post, the observation of one minute’s silence and the recitation of the Ode of Remembrance in both te reo Māori and English. The Last Post is a bugle call with two generally accepted purposes. The first is an implied summoning of the spirits of the fallen to the Cenotaph, the second symbolically ends the day. Similar daily ceremonies have been conducted at the Menin Gate in Belgium and at the Arc de Triomphe in Paris since the 1920s, and a daily ceremony is also conducted at the Australian War Memorial in Canberra. The ceremony is performed by two Flag Orderlies who lower the two New Zealand flags in the forecourt of the memorial, one Bugler who plays a bugle call immediately prior to the commencement of the ceremony and The Last Post, during the ceremony, one person with oversight of the ceremony, known in military parlance as the ‘IC’ or “in charge”, and two Ode Reciters who each recite the Ode to the Fallen, one in English and the second in te reo Māori. The Last Post ceremony will continue on ceremonial occasions at Pukeahu but will no longer occur daily. View the words for the Ode of Remembrance here.